Keep all that bright, beautiful sunshine on the outside of your ride-where it belongs-with this Palm Beach-inspired BDK Sun Shade. Universally-sized to fit most vehicles, these reversible windshield shades are an affordable and inspiring way to defend your ride against harsh UV rays. 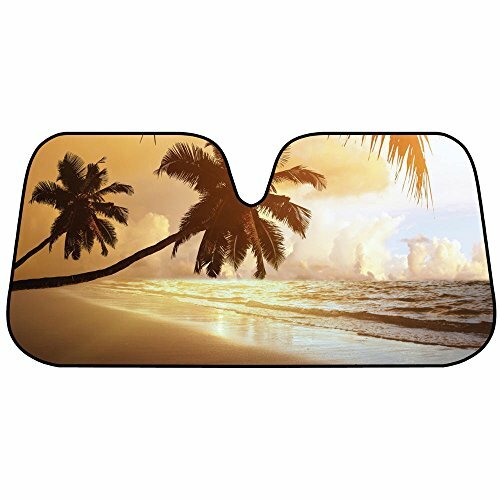 This sunset-themed car sun shade protects your interior from the damage caused by overexposure to the sun while keeping your cabin temp cooler. Designed with a tranquil, sunset scene, the Palm Beach Sunset Sun Shade reflects not only the hot sun, but showcases a gorgeous beach silhouette that will display your personal style. Easy-to-use, accordion-style shades set-up in seconds and include an elastic strap for easy storage when not in use. Your BDK Palm Beach Sun Shade carries a 30-day warranty.